Higher apprenticeships – the way forward? With the mounting costs associated with higher education study, it isn’t any wonder that young people are looking for alternative routes to their chosen career. A recent survey has found that 4 in 10 of the first students to pay the higher tuition fees of up to £9,000 per year, say university is not good value. Opinion varied between students doing different types of courses however. Two-thirds of those studying science, technology, maths and engineering – where a lot of practical teaching and staff time is required – said their courses had been good value. It would seem that employers are also looking for more than just academic qualifications. It has always been something of a catch-22 situation for graduates who can’t get a job because they don’t have the required work experience, despite having relevant qualifications. A recent study by the Institute for Public Policy and Research revealed that graduates and A-level students are three times more likely to be jobless a year after finishing their courses than apprentices. It also found that unemployment rates have risen at all levels of education, except within apprenticeships. and enhance opportunities for social mobility. Higher apprenticeships, created in 2009, offer a work-based learning programme which includes the achievement of academic and vocational qualifications and learning from level 4 up to bachelor’s and master’s degrees at levels 6 and 7 respectively. Degree apprenticeships are the latest model to be developed as part of the higher apprenticeship. Research by the Centre for Economics and Business Research (CEBR) has estimated that the lifetime benefit of undertaking an intermediate apprenticeship is extra earnings of between £48,000 and £74,000, and an advanced apprenticeship between £77,000 and £117,000. This figure rises to over £150,000 for a higher apprenticeship, comparable to university graduates. In 2011 the government announced a £25 million fund to support up to 10,000 advanced and higher apprenticeships in order to help businesses, particularly small and medium sized enterprises (SMEs), gain the high level skills they need to grow. The Higher Apprenticeship Fund (HAF) aimed to develop a range of higher level apprenticeships, and fund 20,000 apprentices by 2015. The fund was awarded to 29 higher apprenticeship projects, in sectors including accountancy, engineering and law. The government has announced an additional £40m to fund places up until July 2015, and an extra £20m to fund the higher educational element to the end of March 2016. Following the introduction of the fund, the number of higher apprenticeship starts rose by 68% in 2011/12. There were almost 10,000 starts during 2012/13, representing growth of 165% on the previous year. In the last academic year over 9,000 people started a higher apprenticeship, with numbers continuing to grow. With the growth in higher apprenticeships, universities and other higher education institutions (HEIs) have an important role to play in this provision. The 2015/16 academic year is the first time that there will be a substantial group of HEIs in the apprenticeships delivery network. A collection of recent think pieces have made a strong case for greater vocational education through universities and colleges. One contributor notes that governments around the world widely accept that vocational education is the way to meet growing industry needs and fill identified skills gaps. But policy makers in the UK are faced with the obstacle of an old-fashioned education system. It is clear that the traditional form of higher education is not going to supply businesses with the higher level skills needed for economic growth. According to research by the UK Commission for Employment and Skills (UKCES), by 2022, two million more jobs will require higher level skills. More than one in five of all vacancies are ‘skills shortage’ vacancies – where employers cannot find people with the skills and qualifications needed. The research highlights the importance of collaborations between employers and universities in the supply of highly skilled people to meet this demand. It argues that universities and employers need to be innovative, and engaged in promoting different and non-traditional routes into higher skill roles. Good practice evidence of such collaboration already exists in the UK, as showcased by the 12 case studies, which explore the reasons for and benefits of collaboration in six industrial sectors – Advanced Manufacturing, Construction, Creative and Digital, Energy, IT and Life Sciences. Across a wide range of collaboration with employers, universities contributed more than £3.5 billion to the UK economy in 2012/13, a 5% increase from the previous year. Significant volumes of courses and continuing professional development (CPD) are also provided by UK HEIs directly to employers, with £423 million worth of business completed in 2012/13, of which £19 million was with SMEs. Nevertheless, there is still much room for improvement. Policy makers, HEIs and businesses all need to work together if the drive towards higher level vocational education is to succeed. The Idox Information Service can give you access to a wealth of further information on vocational education – to find out more on how to become a member, contact us. With the abundance of information available these days and with time becoming ever more valuable, finding the information you need when you need it can be an arduous task. Whether you are interested in a particular topic in general or need to be kept abreast of latest developments, having tailored information sent to you at times that suit you is invaluable. This is something the Idox Information Service can help with. As highlighted in our previous blog showcasing the service, current awareness services are a large part of our offering. 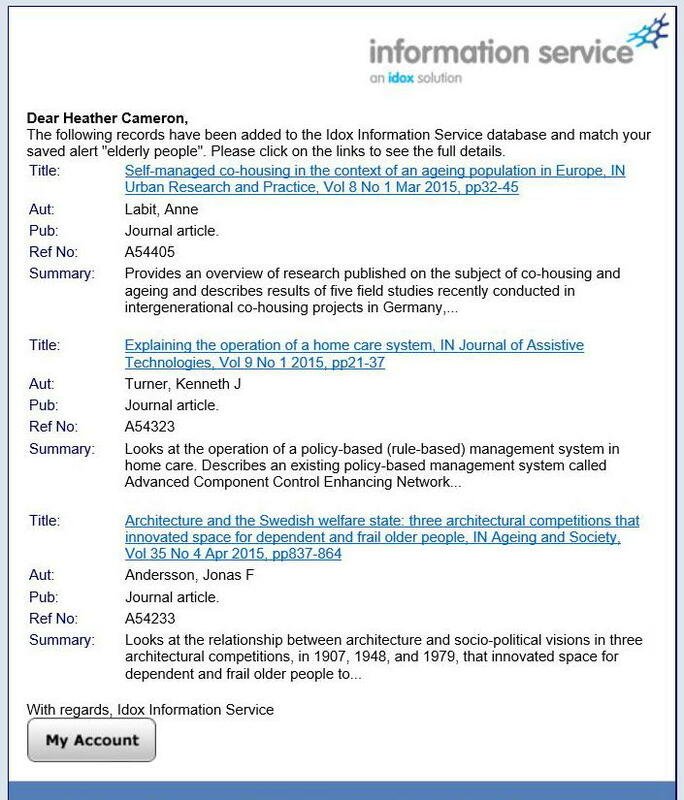 In addition to our weekly bulletin providing a selection of the latest policy, research and comment added to our database, and our more subject-specific fortnightly topic updates which include 29 topics to choose from, we also offer the option of information alerts that allow for an even greater degree of personalisation. With the Idox Information Service’s email alert service, our users can create a customisable schedule of alerts on topics of specific interest. So if co-housing is an area of particular relevance but you don’t want to receive items covering the wider topic of housing (which you can find in our housing topic update) then an alert on co-housing will pinpoint only those items of interest. If there are no items in the selected time period that match your results, you will not receive any emails. And if you are going on holiday, you can also suspend the alert while you are away and reactivate it on your return – no need to worry about your inbox being clogged up! 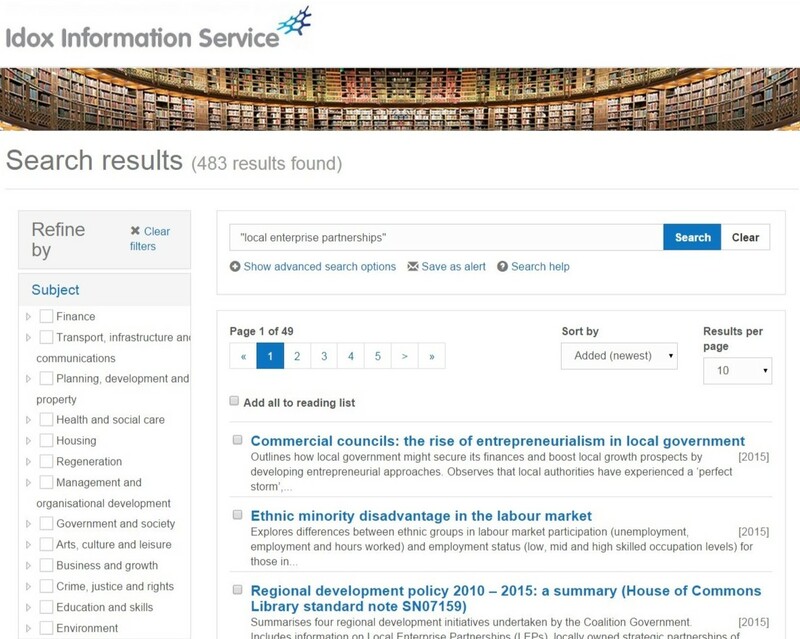 These tailored updates allow you to receive focused information on the specific subjects that you need for your work, and you can adapt your search criteria to reflect your changing information needs as often as you like. For example, if you think you receive too many or too few records, changing your search terms in order to broaden or narrow your search may help. 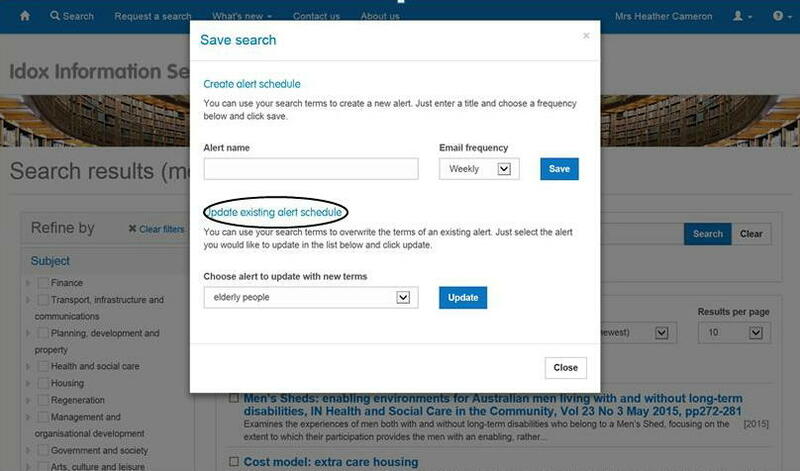 Our information alerts provide an efficient way for users to receive the tailored information they need and expect. Hopefully this article has shown how easy they are to set up. If you’d like to find out more about our email alerts, or any other aspect of the Idox Information Service, you can contact us.